Beta cell destruction in Type 1 diabetes and insulin resistance in Type 2 lead to metabolic disturbances, and potentially to disabilities or death. To stay healthy with diabetes requires paying attention to the day to day details that others with intact beta cells and responsive fat, liver, and muscle cells can simply ignore. Real relief may be in sight for those overworked beta cells and souls with diabetes. Researchers are closing in a better solution to diabetes through direct: replacement of damaged beta cells. Why are beta cells so important? Beta cells reside in the pancreas, an organ about the size of your fist, that sits behind the stomach. Only about 2% of the pancreas' total weight is made up of insulin-producing beta cells. But in the healthy person, these cells are critical to the delivery of energy throughout the body. Healthy beta cells deliver stored and manufactured insulin directly into the portal vein. The portal vein is the blood vessel that picks up digested food from the intestine on its way to the liver. The liver plays an important role in blood sugar regulation: on its first passage through the liver, half the glucose digested from food and half the insulin released by the beta cells are removed by the liver. This keeps blood sugars from spiking after meals and also keeps insulin levels lower in the bloodstream. Beta cells are designed to deliver insulin in the right amount at the right time to keep blood sugars normal. They are also in the right place, able to release insulin into the portal vein together with digested food on its way to the liver. In Type 1 diabetes, beta cells eventually produce no insulin at all. In Type 2 diabetes, the beta cell is working overtime, stressed because of insulin resistance in surrounding muscle and fat cells. Why isn't beta cell replacement available yet? Several problems have plagued the replacement of beta cells. Beta cells are very hard to remove from the pancreas without injuring or destroying them. Even if the removal is successful, finding the appropriate material to surround the intact beta cells or islets to keep the immune system from destroying these cells as soon as they are introduced into the body is difficult. A third problem is that stem cells are gradually lost and need to be replaced.Keeping the encapsulated cells alive as long as possible reduces the frequency of sugical replacement. The normal pancreas has about one million islets, and although a person can lose over 80% of these before diabetes develops, transplanting far more than 20% of the total seems to be necessary before blood sugars can be corrected. Labs such as Islet Sheet Medical in San Francisco estimate 700,000 islets are needed for total reversal of diabetes. How are these problems being overcome? New techniques have been developed that successfully isolate the beta cells from the larger pancreas. Immune suppression was attempted with some success to protect cells after transplantation, but the danger of suppressing the defense system and the toxicity of the drugs used have largely eliminated this approach. (One exception is when transplantation of another organ, like the kidney, is required for life. In this situation, immune suppressants are needed for the rest of the person's life to protect the kidney.) Some progress has been made by transplanting beta cells into areas of the body where the immune system is not as active, but, overall, these approaches have not fared well. Fortunately, progress has been quite good in the use of natural and synthetic membranes that are used to "encapsulate" or surround the islets. These membranes have pores that are large enough to allow insulin and glucose to pass freely, but small enough that antibodies are unable to reach and target the new beta cells as foreign. One technology uses a chemically modified seaweed membrane to protect the beta cells. Typically, these implanted cells gradually die and have to be replaced with a smaller number of new ones every few months. Are beta cell transplants only for Type 1? This is an unanswered question. Although those with Type 1 diabetes (where beta cells are destroyed) are the most obvious to benefit from these transplants, there may be hope for Type 2s as well. In about 15% of those with Type 2 diabetes, the cause of their diabetes appears to be destruction of beta cells just as in Type 1, and islet cell antibodies, characteristic of Type 1, can be detected. Although the immune system is slower to wreak havoc when people are older, the cause of the diabetes is identical to those who get it as children. So for some 10% to 20% of all those who have diabetes, beta cell transplants look promising. What about the rest? Here, the picture gets a little muddier. Most people with Type 2 diabetes develop their disease, at least initially, not because beta cells are lost, but because of resistance to insulin. Over time, the beta cells gradually get worn down because they have to produce so much excess insulin. As beta cells die from "overworking", their loss contributes to the rising blood sugars, but the underlying insulin resistance is still the major problem. Beta cell transplants would probably help to keep the blood sugar better controlled (and this itself lessens resistance to insulin), but beta cell transplants do not correct the underlying insulin resistance. 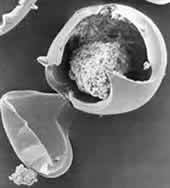 Currently, yearly costs are estimated to be $20,000 to $30,000 a year for beta cell encapsulation. Cost reductions will hopefully occur over time due to improvements in donor sources, harvesting technologies, self-regenerating cell cultures, and mass production of encapsulated islets. Scott King, M.A. (not related to Scott King editor of Diabetes Interview) of Islet Sheet Medical in San Francisco has been attempting to encapsulate islets within sheets of alginate from kelp that grows off San Diego. These "bioinvisible" islets must be kept completely impermeable to the immune system to prevent targeting of these foreign cells by the immune system. The thin sheet method used allows access of the cells to the oxygen and other nutrients they need (a common problem in beta cell transplants). They also allow the transplant to be removed after surgical implantation, if necessary. Vivorx in Santa Monica, CA, another company working on islet transplant technology can be reached at 1-310-264-7774 (or 011-1-310-264-7774 outside the U.S.).